In the summer of 2010, Tracey Flanigan merged her passion for nature and flowers and her absolute love of fine art into a full service floral business aptly named, Art In Bloom. With over twenty-five years of experience in the floral industry, a fine arts degree in drawing and painting and a background in art education with Brighton Area Schools, Tracey wanted to formulate a floral business that would reflect her skills and talents, as well as provide a unique concept for her clients. A location on Main Street in downtown Brighton has been the perfect fit. If you take a look at the “Art In Bloom” page of this site, you will see some of the art and flower pairings that Tracey offers year round from her studio. Floristry is a part of the family and you can often find Tracey’s mom in the studio creating corsages and boutonnieres or assisting customers. In the 1980’s and 90’s, Bea Flanigan owned, Bea’s Flowers & Gifts in Plymouth Twsp, MI and Tracey learned the basics of floral design and business ownership while working with her mom and attending EMU. 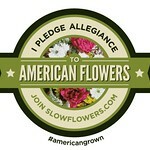 Tracey is compelled to source American grown flowers and use local resources whenever possible. She is currently working with two local flower farms and also sources fresh materials from her own cutting gardens. Thanks so much for taking the time to read this page and we hope to talk with you soon- either on the phone or in the studio! Old Mission Cherry Orchard, pastel on sanded board. Heavenly Scent, oil on canvas with palette knife. yes, here it goes…. I believe in you!! I have always admired your strength and courage, Missy. I know it will be a success. Will be popping in here for more from far but close. Congratulations on your new adventure. I wish you the very best of luck. Can’t wait to look over the list of classes with Alex in the Fall! Congratulations Mrs. Flanigan! How wonderful for you to take on this new venture. My children, Lauren, Tommy & Rachel were prior students of yours and really enjoyed your classes. You may recall, I wrote a children’s book, which is about flowers which may be a great addition to your store. It sold quite well at Lucky Duck Toys in the past. The illustrations are very lively and vibrant. Check out my website if you are interested. In any event, my family and I wish you great success and I am sure we will be shopping at your store. Best of luck to you! I love being able to watch things unfold through this blog. And how nice that you got to spend time in the space yesterday, allowing your thoughts and dreams to take shape. I just looked at the pictures of the store and I think it is perfect for what you intend to do with it. I am very proud of you and I know you will be successful. It is definitely the right time for this to happen. Trace, I am so excited for you! I love the whole idea of it all–flowers, art, teaching, showcasing artists, showcasing yourself 😉 I have thoroughly enjoyed exploring this site and getting reconnected with your amazing work. I am so proud of you and am positive that you are boldly and gracefully travelling down the exact right path. xox. Yea!!!! Looks soooo good!!! I am truly happy for you. Hey, my daughter is getting married next May and I could use your expertise and suggestions. How convenient to have your store so close. See you later today and tomorrow at 12:00. Way to go, Tracey!!! Good luck to you. Best of luck with your new business. Brighton needs a good art venue (flowers, too). Looking forward to seeing some nice art on your walls. Your shop is lovely. It’s a wonderful fit for downtown Brighton. I am honored that you’ve included my work. I look forward to your class at the Hamburg Township Library on Saturday, May 7, 2011. Date change… Tracey will be conducting a lovely spring floral arrangement class and will provide great decorating tips at the Hamburg Township Library, our Lunch & Learn Series, Thursday, April 7, 2011, 11:00am-1:00pm. She will not be coming to the library in May, as originally planned. You are encouraged to bring a lunch. At one of our Lunch & Learn series, a thoughtful patron invited her best friend who was having a birthday. She packed a picnic basket of delicious food and the 2 of them had a lovely time celebrating the special day, enjoying each other’s company and learning an interesting craft, iris paper folding. Marilyn…I’m looking forward to conducting this course and being a part of Hamburg Library’s Lunch & Learn Series. Thanks for inviting me! More info to come after the first of the year. Tracey, It was so nice to see you and your store last night – the children and I enjoyed it. You have been an important part of their art world in their early years, and I am happy that you are extending your talents and creativity to the community at large. It is a wonderful addition to the downtown scape. We wish you the best of luck and will be popping in often to see you. I love your site! Thank you Tracey for working with me on my order. My mom is thrilled with her arrangement for her 85th birthday. Cheryl…Thank you for letting me use my creativity in designing your mom’s arrangement. I’m so happy to hear that she liked it! It was nice speaking with you yesterday. I look forward to meeting you in person, exploring your wonderful place, and working with you to see which of my artwork compliments your style! Cheers and Good Luck… may we both find success in our business ventures! Memories from high school tells me that we talked about dreaming of being our own boss… and here we both are… where we were then… you in art and me in child care… how awesome is this? PPSS… I will get to your shop sometime soon… I promise… my mom and sister both say it is a beautiful place. My name is Samantha, and I was given your contact information regarding your lovely flowers you create for weddings. Wanted to get a price quote on what to expect? Also, if you were available on our date which is 11/11/18. Thanks so much for your inquiry about my floral services for your upcoming wedding! I do have your date available on my calendar at this time and would love to discuss flower options with you. I will send you an email directly so that you can fill in a Wedding Details Form.